Two promising stocks. Two strategies for achieving long-term growth. Which one deserves consideration for your portfolio? Although the word "biotech" is often used interchangeably with "biopharma," biology as technology is not confined to healthcare applications. That's the message engineered biology conglomerate Intrexon (NASDAQ:XON) is trying to send out to investors. Sure, it has a formidable lineup of clinical trials and biopharma partners, but it's also leveraging the power of biology to develop next-generation transportation fuels, mosquito-control tools, specialty fruits, aquaculture solutions, and more. That certainly doesn't mean opportunities in healthcare are less worthy biotech applications, of course. Bluebird bio (NASDAQ:BLUE) has grabbed the attention of investors with an impressive pipeline of immunotherapies aimed at using the body's own immune system to treat rare diseases and cancers. Recent data, a strong balance sheet, and support from a blue-chip partner are solid reasons to consider the stock's future potential. While both companies have great promise, they present different obstacles and strategies for investors. 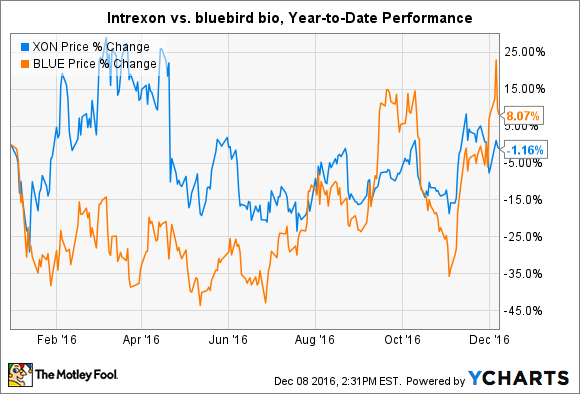 If you had to choose one for your portfolio, which is the better buy: Intrexon or bluebird bio? As I mentioned, Intrexon is not a traditional company. Its general mission is to become a leader in the burgeoning field of engineered biology, no matter where that leads. The strategy to achieve that goal is relatively simple to understand, although it has been implemented with extreme complexity. The company generates revenue in three ways: licensing its portfolio of biology tools and collecting collaboration payments, R&D services, and selling physical products. The idea is that Intrexon will be reimbursed for most of its R&D expenses from partners -- de-risking development of products -- and then collect sales or royalties on products that make it to market, whether fuels, genetically engineered mosquitoes, or a new cancer drug. It hasn't exactly worked that way, though. Leading pipeline products have suffered regulatory setbacks (mosquito-control tools, fast-growing salmon) and slower commercialization than investors have patience for (non-browning apples, insect fish feed). Meanwhile, several therapeutics have faced clinical setbacks, and its early stage fuels program faces considerable technical and regulatory hurdles. The hurdles aren't always Intrexon's fault; the nation's regulatory systems are usually lagging behind the pace of innovation in biotech. And several leading products should gain regulatory approval in a matter of time; it's only a question of when. Still, the $3.5 billion company is a little too dependent on a risky revenue machine at present, with micro-cap companies comprising most of its collaboration and licensing revenue. In sharp contrast to the shotgun approach of Intrexon, bluebird bio is solely focused on biopharma, and specifically immunotherapy. That has its drawbacks, such as a lack of revenue. Whereas the engineered biology conglomerate generated $82.1 million in revenue in the first nine months of 2016, the immunotherapy developer has notched just $4.6 million. The biopharma-only approach its advantages, too. Although its fate is completely dependent on clinical data for development stage drugs, investors are hoping they will lead to enormous gains and future growth if they gain marketing approval. Bluebird bio recently announced very encouraging results from a small, early-stage trial of its drug bb2121 in patients with multiple myeloma who have relapsed after prior treatment. There were only nine patients in the study, but the response rate was 78%. Two patients had complete responses at four and six months, and none suffered from grade 3 or grade 4 toxicity issues. It was a comforting piece of good news for the potential of CAR-T immunotherapies after high-profile issues with Juno Therapeutics' leading candidate have brought negative attention to the field. Investors are also encouraged by the involvement of Celgene, which owns the top drugs for first- through third-line treatments for multiple myeloma. While shares shot higher on the news of bb2121's early victory, bluebird bio wasted no time in taking advantage of the situation to pad its balance sheet. The $2.4 billion company quickly announced the offering of $200 million in common stock, which would push its cash pile well over $700 million to close out 2016. That's good, because R&D expenses are starting to soar as clinical trials mature, but it highlights a major risk of investing in a stock that will have a binary outcome for investors. Both stocks have a fair share of risk. Intrexon is losing vast sums of money while leaning a little too heavily on weak and suspect partners as it waits for products to be approved, while bluebird bio is an early stage biopharma that may or may not gain marketing approval for its first-of-a-kind CAR-T immunotherapies. Intrexon offers steady growth and plenty of shots on goal in product development, which lessens the impact of any single failure. Meanwhile, bluebird bio investors are counting on marketing approval for a home run, otherwise it may turn out to be a bust. Which company is the better buy? Although both stocks are fairly risky, the better choice may come down to your investing style. If you feel like playing the lottery for your shot at a jackpot, then the promising clinical pipeline of the $2.4 billion bluebird bio could be considered for your portfolio. If you want a little more certainty and insulation from product failures in the long term, then Intrexon could be a good fit.